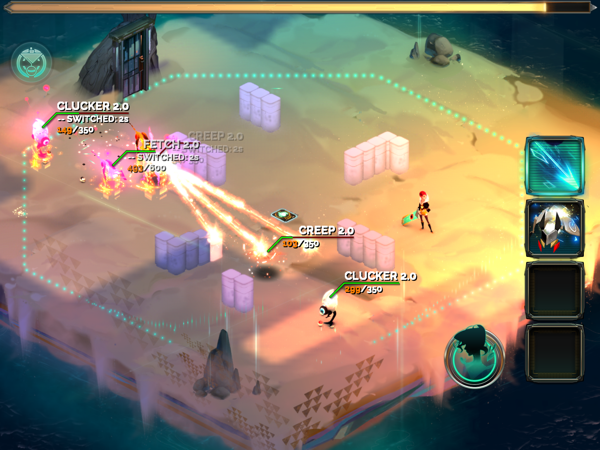 Supergiant Games, the developer behind Bastion, recently surprised everyone with a ninja release of their hit console and PC game Transistor on iOS. I had been following news about the game for a while, hoping it would come to iOS, since Bastion was so well-received. But there was so little news about it, that I assumed it wouldn’t be coming anytime soon. Then, on a release day when no new games were catching my attention, I woke up to a pleasant surprise. 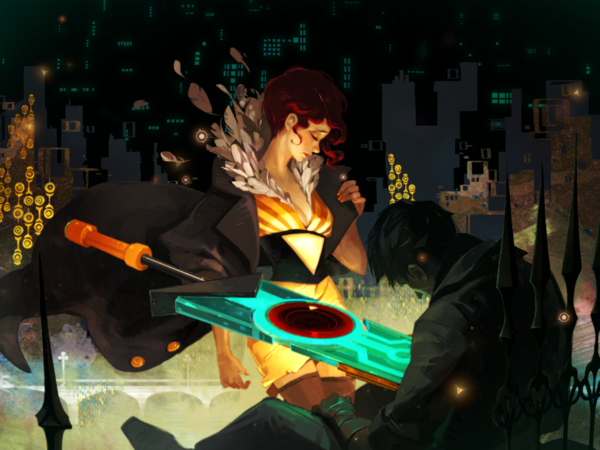 I honestly didn’t know that much about Transistor, other than that it features a red-headed female protagonist named Red who wields a giant sword called the Transistor. Oh, and the artwork looked gorgeous. Gameplay-wise, I was pretty much diving in blind. And I won’t lie, I had a bit of a rough time at first. The game had a steep learning curve for me, and I stumbled along in the beginning, not really sure what I was doing. But once I figured out how to defeat the first boss and picked up a few more skills, or Functions, everything really opened up for me. I was suddenly hooked. 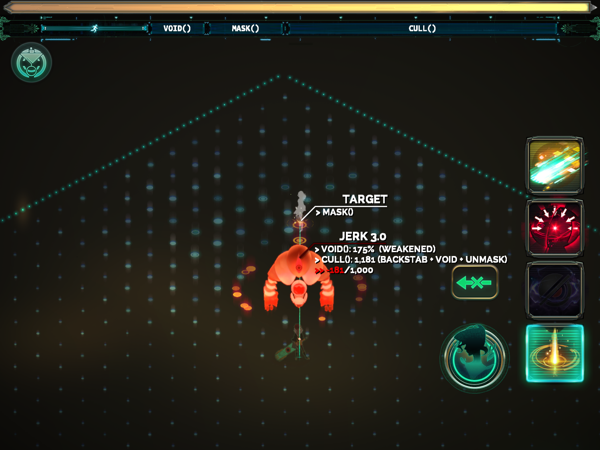 I got a little robotic pet to help me out and I was thoroughly enjoying the strategic aspects of the game. So how does Transistor work? You play as a Red, whose voice was taken by the group called the Camerata, who also killed a man very close to her. He lost his body and his consciousness got trapped in the Transistor. He is the narrator and speaks throughout the whole game, guiding Red and making sense of your surroundings. He’ll reveal bits and pieces of the story as he guides you. The story is never told straight out. It’s very cryptic, told through news clippings on computer terminals and even the descriptions of the people trapped in the Transistor. Red sometimes even talks to the Transistor through comments on the terminals, since she can’t speak. If you don’t pay close attention, or unlock all details of a Function, you could miss things. As you kill certain enemies, they get sucked into the sword as Functions. 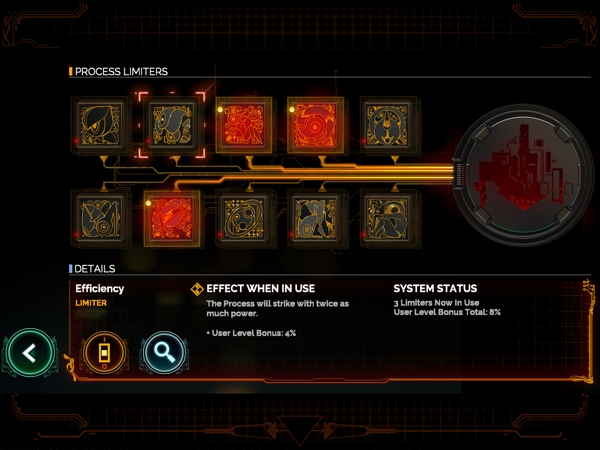 You also get to choose from a few new Functions each time you level up. Each Function works like a skill with its own, well, function. You can slot up to four of them as main skills, which you can tap to use during battle. 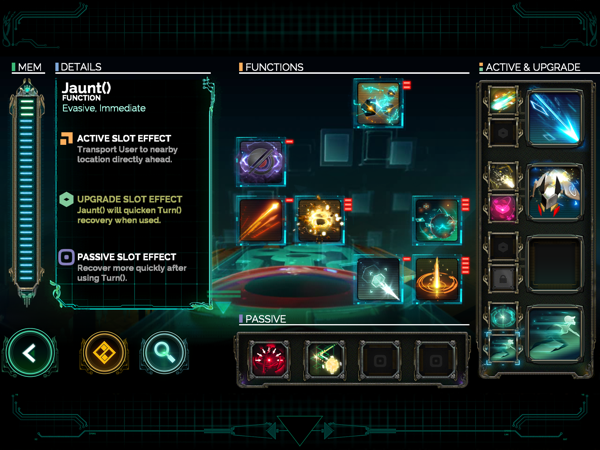 But each one can also be slotted into others as upgrades or used as a passive skill. This allows for so much strategic variation, since there are sixteen different Functions. The combinations and strategies are practically endless. You can spend so much time just playing around with different combos to see what works best. While you’re searching for Red’s voice, you’ll also be finding your own. Each player will likely discover their own build that they like the most. For example, one of my favorite combos is the Help() bot equipped with Switch() and Purge(), so he barks at enemies and briefly turns them into allies while also damaging them over time. This means I have fewer enemies to deal with at once. What makes the game even more unique is the Turn() phase. When you press the Turn() button, you pause the game and can plan out a sequence of moves. You can actually see the result of each move if you decide to go through with it. If you don’t like what you see, say, because an attack is blocked, you can undo it and try something else. But once you end that turn, you’ll have to wait a short time until you can start another one. So there’s a mix of strategy and live combat that I’ve never experienced before in a game. It works surprisingly well and gets pretty addictive once you start to get the hang of it. But don’t get too comfortable with one strategy. The game throws some tests at you for bonus experience points, and they each have a strict set of parameters. Most limit your functions to a pre-selected few. Some will ask you to clear the board in a single Turn(), while others require you to last a certain amount of time. These all force you to think outside your comfort zone. And later on, you’ll encounter enemies that might require a completely different strategy than you’ve been using for most of the game. Once you enter an area with enemies, it gets walled off by an invisible barrier and you can’t leave until you finish off all the enemies. If you take too much damage in battle and run out of health, you don’t die. Instead, Emergency mode kicks in. But if you take any more damage after that, one of your Functions gets disabled until you find your next access point. This means the game will be harder until then, but at least you still have a chance to try and win the battle until you run out of Functions. If you’re not willing to take that risk, though, you can abort a battle that’s not going your way and return to your last access point, which is where you can access other Functions and automatically save the game. 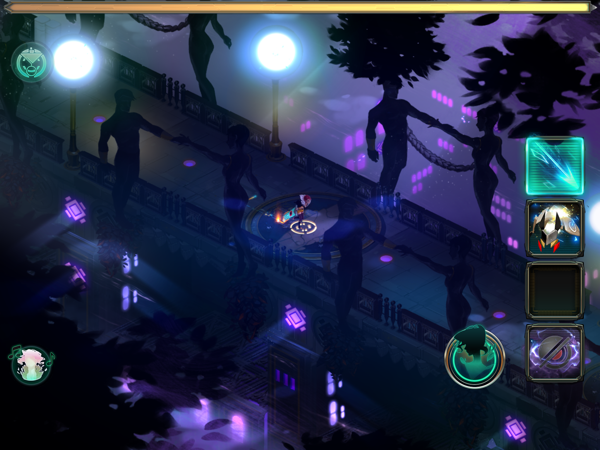 There are two touchscreen control schemes in Transistor, as well as one for MFi handheld controllers. I tried both the tap-to-move and the digital joystick and found the tap-to-move more comfortable, at least on on my iPad. It meant I could rest the device in my lap and control the game mostly with one hand, despite the hectic battles. For the most part, the controls work well, but I did come across some issues I’ll touch upon later. The game is so gorgeous, that I had trouble choosing which screenshots to use in this review. Since it takes place in a futuristic science fiction world, there was a lot of freedom with its appearance. 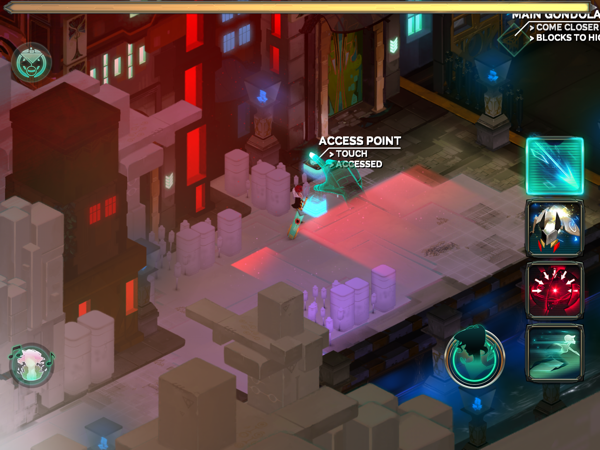 The world is made up of colorful buildings and blocky structures, not unlike the world of Bastion. The colors are vibrant, and every inch is just a pleasure to look at. The animations are spectacular as well. Each Function sets off its own unique animations that are smooth as butter on my Air 2. I also love how the sword is so big that Red drags it along on the ground, creating sparks. Besides the amazing visuals, you’ll also be treated to a superb audio experience. I really can’t say enough about the soundtrack and voice acting. They’re both incredible, capturing the mood of the game and the personalities of the characters so perfectly. The soundtrack is lengthy, as well, keeping it fresh and never boring. You really get the whole package here. If you happen to find the game too easy the first time around, you can replay it in Recursion mode, which is like New Game+. You get to keep all your functions, experience and anything else you earned, but enemies are much tougher. But you won’t just play the same enemies with more health, as you’ll see in most games with a hard mode. Instead, you’ll face the trickier enemies right from the beginning, and you’ll encounter surprise battles in locations that were previously safe. But you’ll also have a chance to earn any functions, permissions and limiters you missed out on the first time, as well as the ability to earn duplicates of some functions. This opens the game up to even more options, as you can now use the same ability as both a main and a passive, or even as an upgrade to itself! I got so pulled into the Recursion that I couldn’t stop playing. There aren’t too many games that manage to keep me interested enough to play all the way through a second time, but I found the Recursion even more compelling than my first play-through. You can also make the game harder using Process Limiters. There are ten of them to collect, each one either giving the enemies an advantage or Red a disadvantage. The trade-off for this extra burden is that you get an experience bonus when you have one equipped. Harder ones give more experience, but they also create more of a risk. Still, it’s fun seeing what you can get away with. There are also plenty of GameCenter achievements to give you more of an incentive to use them. Let’s talk about some technical stuff. Everything felt very small on my iPhone 5. It’s certainly playable, but I would highly recommend playing on an iPad. 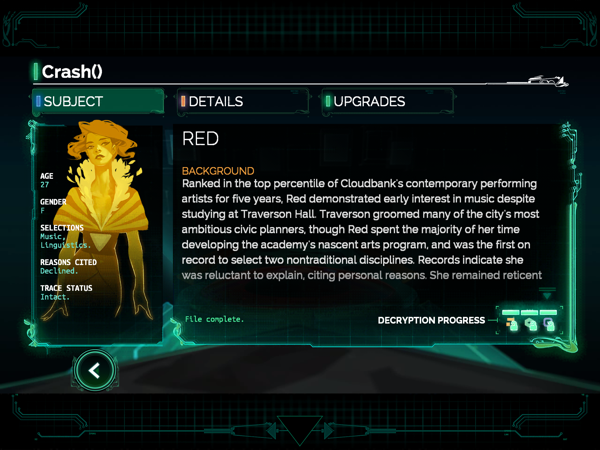 While I’m glad the game has flawless iCloud capabilities to allow players to play the same game on multiple devices, I never really felt compelled to play Transistor on the go. The battles can be a bit too hectic to play it with distractions. Also, the music and voice acting are so good, that I prefer to play the game when I can pay close attention to them. It also means you’re less likely to miss important story elements. The game also lagged a bit during battle on my iPhone 5, so I recommend playing on a newer device. Everything looked and played beautifully on my iPad Air 2. There were one or two crashes, but nothing major. My only real complaint with the controls is that button selection areas seem to be a bit off because sometimes I’ll tap one and instead Red will walk to that location on the map behind the button. It doesn’t happen all the time, but enough to be an occasional nuisance. If you don’t notice it while in Turn() mode, you might waste a move on it, throwing your whole strategy out the window. 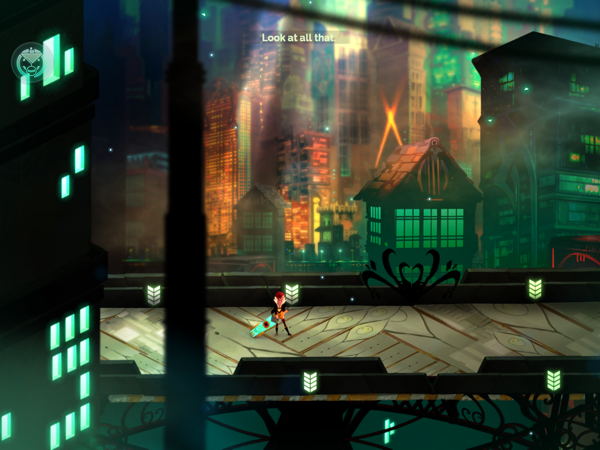 Overall, Transistor made the move to mobile very nicely. If you’re looking for a unique action RPG with a mysterious story, gorgeous audio and visuals, you can’t really go wrong here. There are a few touch control issues, but they’re not enough to ruin the game. It’s nearly flawless and well worth your time. In fact, if it had an endless survival mode (I haven’t found one yet), I’d have trouble pulling myself away to play other games. If it sounds like something you’d enjoy, download the game here. You can also watch this short iPhone 5 gameplay video I made. Ignore the occasional odd blips in the audio; those are from my recording software, not the game. Great review! I’m loving the game so far. It really is gorgeous. Glad you’re enjoying it! 🙂 Play around with some builds. Omg the last performance test is 16 waves lol.